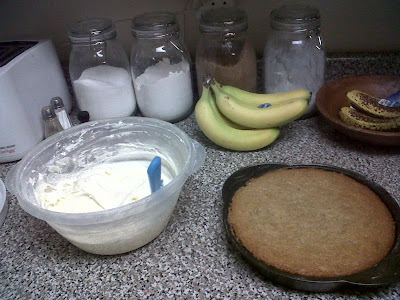 One of the recurring dilemmas in my kitchen is what to do with overripe bananas. Sure, there’s banana bread. I’ve even played around with different kinds of banana muffins. But until today, I’ve never thought of making a banana CAKE. Genius, kids, absolutely genius. Since I had buttermilk in the fridge, I just searched ‘banana’ + ‘buttermilk’ + ‘recipe,’ and found this dandy. Oh. MY. GOSH. Delicious doesn’t even start to describe this. 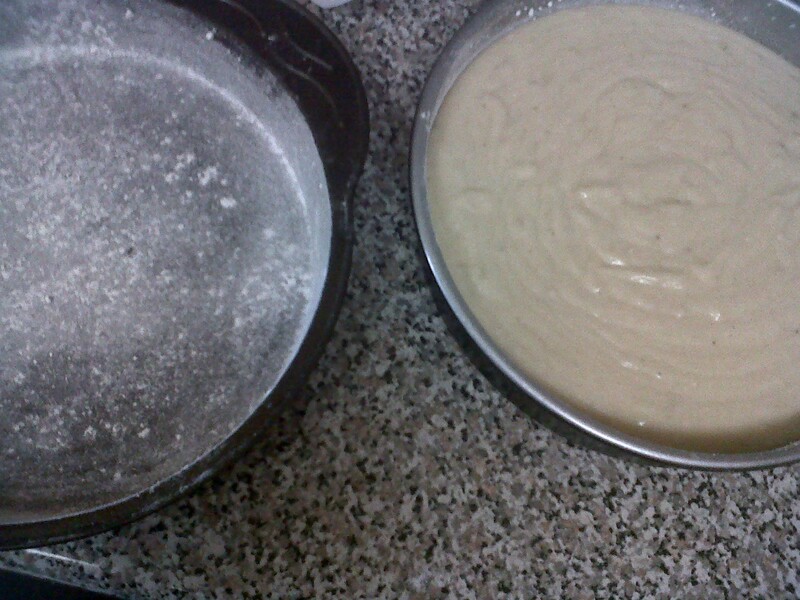 a floured pan and a filled one. that batter was so tasty i was tempted to sip it with a straw! Preheat oven to 275°. Grease and flour a 9” x 13” pan (I used two 9” round cake pans). In a small bowl, mix mashed banana with the lemon juice; set aside. In a medium bowl, mix flour, baking soda and salt; set aside. my unglamorous counter space. and some cake and frosting. In a large bowl, cream 3/4 cup butter and 2 1/8 cups sugar until light and fluffy. Beat in eggs, one at a time, then stir in vanilla. Beat in the flour mixture alternately with the buttermilk. Stir in banana mixture until completely blended. Pour batter into prepared pan and bake in preheated oven for one hour (I kept my cakes in the oven for about an hour and a half because they were taking for-EV-er) or until toothpick inserted in center comes out clean. Remove pan from oven and place directly into the freezer for 45 minutes. This will make the cake very moist (it was already QUITE moist, but, you know). For the frosting, cream the butter and cream cheese until smooth. Beat in 1 teaspoon vanilla. Add powdered sugar and beat on low speed until combined, then on high speed until frosting is smooth. 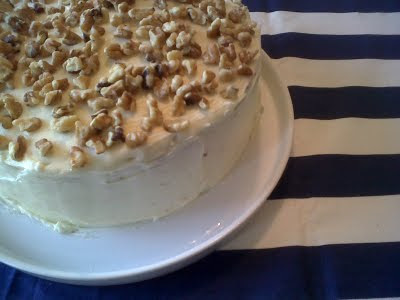 Spread on cooled cake, and sprinkle chopped walnuts over top of the frosting, if desired. 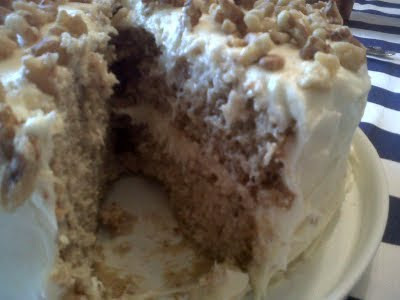 Notes: I made one and a half times the frosting recipe so that I could do a double-layer cake, and it was the perfect amount. Also, I thought the frosting was too sweet, but all of my friends assured me that it was perfect. One roommate even declared that this was the best cake she had ever had. Ever, folks, is a long time. I am proud. And another thing: this cake took a long time. Prep time is about 15 minutes, but with baking and frosting, we’re talking 2 hours. Recommended for: whenever you have overripe bananas in your fruit bowl, and basically any special occasion that deserves a ‘wow’ factor. I think this is my most universally appreciated baking experiment in recent history. Yay (or should I say, YUM)! I love that your cooking revolves around google searches for recipes. This looks AMAZING. Glad you enjoyed it! oh my goodness, this looks delicious! :D smart lady, my sister! and i don't blame your roomies for singing your culinary praises, they're well-deserved! Wow. That looks decadent and lovely. I'm a little jealous! If I made this I'd have to eat the whole thing and that would be disastrous. My family doesn't like anything baked with banana or nuts, and of course I do. :) Maybe I can make it for a potluck or something. I had to wipe the drool off my chin. Looks so good! That banana cake looks freaking awesome! YUM! My mouth was watering just looking at the pictures and reading the recipe! when going from oven directly to freezer, is that when you remove the cake from the baking pan? Anonymous: I put the cake IN PAN directly into the freezer. I took cake out of the pan after I took it out of the freezer.